This chocolate cake is moist, delicious, and vegan friendly! 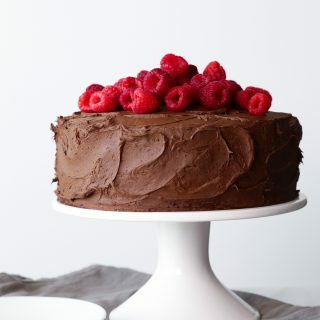 It has a generous layer of a raspberry chia filling in the center and a fluffy chocolate frosting! Gluten and refined sugar free variation included. Melt chocolate chips and coconut milk over a double boiler or in the microwave just until chocolate is melted. Cover and refrigerate for several hours, or until firm. When mixture is cold and has hardened, beat on high speed for several minutes, until fluffy. Best to use a stand mixer, if you have one. If frosting is too thick, add additional milk/cream 1 tablespoon at a time, until it reaches the desired consistency. You can use fresh or frozen berries. I used frozen so I cooked them over the stove to reduce the liquid, but cooking is not required for fresh berries. Just mash filling ingredients together and refrigerate until chia has expanded and mixture has thickened. If using frozen berries, heat berries in a medium dutch oven over medium-high heat until thawed. Add chia seeds and sweetener, stirring occasionally, until liquid has reduced and mixture has thickened. Transfer to a container and chill in the refrigerator until cool. Preheat oven to 350ºF. Grease two 8-inch or three 6-inch cake pans and line the bottom with parchment paper . Set aside. Mix together milk and 1 tablespoon vinegar and let sit while you measure out the ingredients. In a large mixing bowl, combine dry ingredients—flour, coconut sugar, cocoa powder, baking soda, baking powder, and salt until well blended. Add wet ingredients—sour milk, coffee, oil, and vanilla. Mix until batter is smooth and thoroughly combined. Pour evenly into cake pans and bake 25–30 minutes, just until center is set and a toothpick inserted comes out mostly clean. Let cool for several minutes then run a knife along the edges of the cake and invert onto a rack to cool completely. Place cream cheese, cocoa powder, and sweetener into a mixing bowl (drain cream cheese first if it has a little water in the container.) If you don't like it too chocolatey or sweet, start with the lesser amount and add more, to taste. Place one cake layer onto your serving plate and top with raspberry chia filling. The filling fill want to ooze out of the sides, so pipe a frosting "dam" around the edge of the cake if you want the filling to stay in place. Place the other cake layer on top and use a large off-set spatula to spread frosting generously around the top and sides cake. Top with fresh raspberries or chocolate shavings and serve. Refrigerate leftovers in an airtight container. Inspired by this recipe from Martha Stewart.